Last time I wrote I was going back and forth deciding how I should approach the 2 large blank canvases that were resting against the wall in my studio. 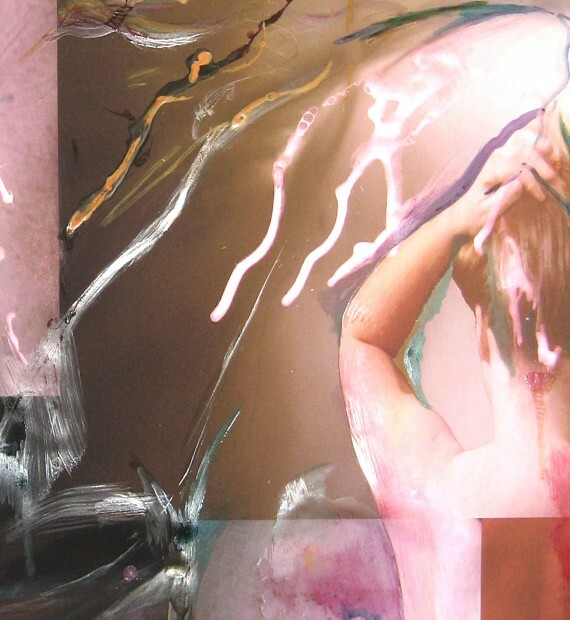 I finally decided I was going to approach one by using collage and the other as a pure painting. It is now nearly the end of December and not a lot has happened – certainly in respect to the collage anyway. Christmas, family commitments and 2 exhibitions I have been involved in rather took over. However, before this hiatus began I did do some painting. 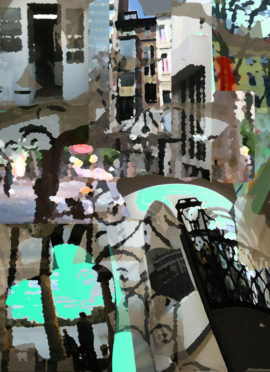 I used a digital montage I created as my starting point and then very quickly and loosely tried to respond to this using just paint. 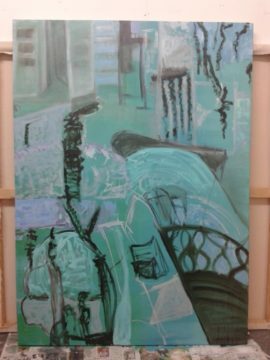 My idea at the time was just to get some marks down onto the canvas and then use those marks and the spaces in-between to trigger further development and experimentation. This has not happened though. The initial marks I have made definitely have a life of their own and created a barrier preventing me from moving forward. I am hoping when I return to the studio my artist block will have diminished. However I do like this initial painting. It has an energy about it and portrays a kind of language I wasn’t expecting. Shown here are 3 compositions. 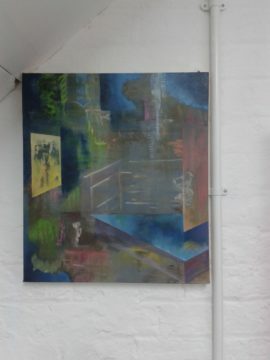 The first is an earlier painting on which I have managed to play with the space unheeded by my own painting restrictions. The other 2 are the original digital composition I created and the resultant painting which somehow is doing things for itself.